May Arts Sweet Treats and a Giveaway! 'Tis the season for baking and giving Sweet Treats! The best gifts come from the kitchen and the heart. The Ribbonistas at May Arts have put on our aprons and our ribbons to create some creative ways to gift your sweet treats. I absolutely love baking for the holidays and creating pretty packages to present the goodies is part of the fun. One thing our family likes to do is give visitors to our home a little surprise to take home with them. I think this lacy cookie pocket is perfect for one large or several small cookies or other treats. 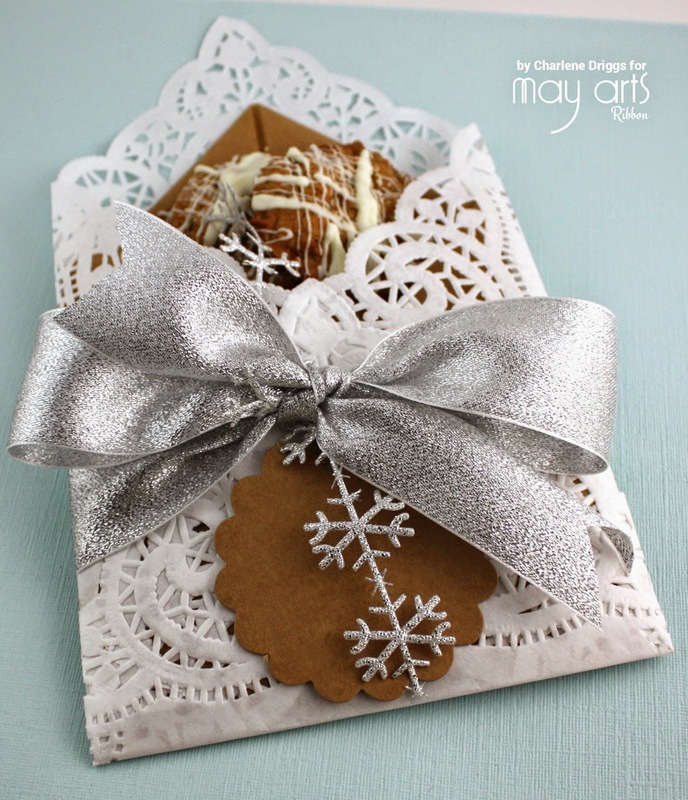 I've packaged some yummy White Chocolate Macadamia cookies in a pretty lace envelope lined with Kraft parchment paper to create an elegant cookie wrap. I added a May Arts Kraft tag and some gorgeous May Arts Silver Metallic ribbon, Silver Snowflakes to add some holiday sparkle. Be sure to pop over the May Arts blog to check out the other Sweet Treats wraps and comment there for your chance to win one of 2 rolls of yummy ribbon for your own sweet treats!